Wafflers unite! | Pre-order by midnight! It's a big, big week over at Simply Leap! First, today launches my new monthly column on Unstuck.com, and it's for the wafflers among us. Unstuck is all about what gets in the way of making big life decisions -- career change, relationships, you name it -- and designed a fun personality test (I love personality tests, don't you?) to help you figure out why you're stuck and how to move through it. The test said I am a Waffler and now I'm Unstuck's official Waffler Champion! This is their awesome cartoon of me. Waffling happens when every option in front of you seems viable and therefore impossible to choose between. When I feel this way, I can convince myself into and out of just about any idea, and then back around to the beginning again. Though it may not feel like it in the moment, I think our waffling is a skill the world needs more of. In today's column, I talk about how useful waffling can be. Check it out, and let me know what gets in the way when you're making a big decision. While you're there, take the Unstuck test to see if you're a Waffler, too! Second, pre-orders of my new book END TONIGHT! Tomorrow morning, the first shipment of shiny new cupcake-covered inspiration will be on its way to readers everywhere. Your copy can be on its way to you too if you pre-order by midnight tonight! When you pre-order, you'll wake up tomorrow morning with a special gift in your email: A Pep Talk from me to you. Because what else do you need when you're feeling stuck, leaping your heart out, starting something new, having a rough day or having a great day? Someone right there with you so you know you're not alone. You need to hear how good you are at what you do. How everything you've done has lead you to this moment and prepared you to face whatever hurdles are to come. You are ready. You are believed in, thought about and cheered for! This Free recorded Pep Talk is available only to those who pre-order by midnight tonight. Bonus Bonus: When you pre-order you're also in the running to win a Free Live Pep Talk. Five lucky winners will receive twenty minutes on the phone with me at a time of your choosing to talk through what's going on and get the motivation you need to go after it in a big way. Have you pre-ordered your copy yet? You only have until midnight tonight! "...so why does it feel so right?" Nearly one year ago to the day my friend - writer and communications consultant Amanda Hirsch - along with her husband and young daughter uprooted from their home in Brooklyn to resettle near their families in Washington, D.C.
Nearly one year later to the day, they are moving back to New York City, and she's leaving her successful consulting business to return to corporate America. I think I can speak for most of the readers of her blog, Having it Alt, that this wasn't what any of us had in mind for her either. After hearing her story, though, it makes perfect sense. "From our first conversation, I felt a strong connection...and the more we talked, the more I felt this pull — this feeling of rightness. When they asked if I might consider a new full-time role they were creating, I said yes, I was open to that. It turns out, that role is pretty much made for me." 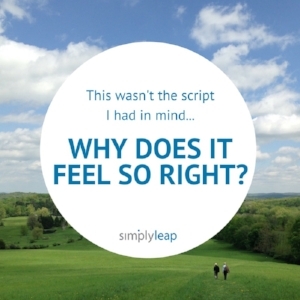 Today's LeapStory is about that feeling of rightness. What can feel like a never-ending uphill search that suddenly turns into the clearest, most comforting "Of Course" ever. Amanda is not only a good friend, but also a fellow A-student-at-life. She knows what it's like to spend a whole lot of time and mental energy trying to make the right choice. We may have had more than one, two, five intense conversations wondering: Is this it? Or, is this? How will you know for sure?!? Then, as most of us have experienced and Amanda just did this week, the right choice walks up and taps you on the shoulder, and all of that wondering fades away as if it was never really that hard to figure out. It doesn't matter that this wasn't what I had in mind. The clarity of an answer can feel so good we just run at it full speed without looking back. But that look back is instrumental to every future leap and to making the most of this right one that just found you. Here's a quick assignment. How did you feel before, when you didn't know and were trying so hard to figure it out? What was the moment when You Knew? That feeling of rightness and shoulder tap. Where were you, what happened, what was the feeling inside? Capture every detail. How did this feeling of rightness set in motion more things falling into place? Because that happens, too. Suddenly you know the direction to go in and people, ideas, opportunities open up in front of you. Keep the answers to these questions somewhere special, so the next time you're searching for the right answer they can remind you not to work so hard, asking everyone for their opinions. You will know. "My mantra these days, as I share news of this major life change with family and friends, is, 'Life is weird.' It really is! Weird and wonderful in its ability to surprise us — and beautiful, in how it provides space for us to continue to surprise ourselves."